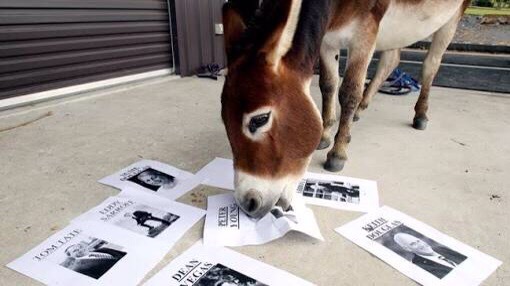 Could we, like America, be heading into a donkey vote election? Given the current sad lack of choice – both in major parties, minor parties and Independents – could the voters, fed up with over a decade of bad government, and potentially nothing to look forward to in the political arena, just decide to vote for…anyone! It is not a good scenario, I know that, but noone could blame them. The last term of Howard, followed by the Rudd/Gillard/Rudd/Abbott/Turnbull fiasco has worn everyone out, and made us a country of cynics in the democraric process. What a joke this has made of our political system! No educated voter – probably becoming a rare species with education cuts – takes our current batch of politicians seriously. Our choice of likeable, decent, fair-minded, secular politicians is about…zero. With the likes of Morrison, Joyce, Pyne, Abbott (the bad smell that just won’t go away! The man’s delusion is staggering!) et al has taken politics to a new low in this country. The opposition is no better, and the minor parties are just that – minor, and even that they are there at all makes one question the often dubious nature of our voting system.